Hundreds of media organisations - membership, subscription, ad-supported, and non-profit - now consider engagement a central tenet of their work. And as an industry we’re in the midst of an extended discussion about the real impact of engagement on increasing revenue or growing audiences. But what “engagement” looks like in practice varies widely across organisations. Take in-person events. For some, readers or members simply turn up and listen. This is not to devalue these events as they can be crucial exercises in increasing an organisation’s transparency and understanding the practical processes that go into creating journalistic work. However, there is another, more involved type of event that enables readers or members to contribute to an organisation’s decision making regarding its coverage, mission, and business development. As a co-founder of the Bristol Cable-turned-researcher (Alec) and a member of the team working on De Correspondent’s international expansion effort (Jessica), we believe the discussion about the value of engagement can be improved by understanding that there isn't a strict set of engagement strategies. This research presents categories of practices that promote deeper, more participatory levels of engagement which move the needle from reception to active co-production. We set out to ask: How are organisations using culture and/or events to put decision-making power into the hands of members? How are organisations shaping their governance structures to facilitate deep levels of participation? How do organisations balance concerns about collaboration vs editorial independence? And what are the challenges to moving the engagement needle, particularly beyond the US and Europe? At one end of this spectrum were practices that helped lift the curtain, allowing members to witness decision making and production inside the newsroom (but with little direct influence on what they saw). Then, we found instances where the results of community participation and engagement informed an organisation’s decision-making. … and those that went even further, to allow for holistic participation in shaping business related and editorial matters. We also began to grasp the constraints on deeply participatory engagement - and not just limits on resources or finding the right ask, but also what threats to press freedom mean for engagement, or the obstacles posed by a diverse linguistic and geographic reach. Read on, and let us know of other collaborative decision-making and co-production examples you’ve come across in newsrooms around the globe. For most people familiar with membership-led media, the Dutch platform De Correspondent, (where Jessica works and which partners with MPP) is a frequent reference. But more than 5,000 miles away a South Korean organisation has also blasted the 40,000 member threshold, and has experience with the boundaries of member collaboration. Journalists who protested against attempts by the previous administrations of former president Lee Myung-bak to control broadcasters and mainstream media formed Newstapa. In the context of threats to press freedom, which continued under the Park Gyun-Hae administration, Newstapa established a reputation for reporting stories no other state-run or privately owned publication would carry. In a culture where membership and donations aren’t well established, the organisation quickly defied the odds to become influential and financially stable. There is no member involvement in the higher levels of operational management at Newstapa. However, Jang Kwang-yun, one of two membership engagement managers, isn’t opposed to more participation but is adamant that a sophisticated system with adequate checks and balances would need to be established. With a name that means “abolish partisanship and commercialism in journalism,” Newstapa is committed to preserving its editorial independence. A recent survey shows that most members agree: Jang said that a majority of their members had no interest in participating in editorial decisions and 70% answered they were satisfied with simply providing financial support. Still, Newstapa is nurturing and developing several channels for member engagement with its journalism. Their offices in Seoul regularly open for events aimed at members and the wider public. Journalists present the behind-the-scenes work for stories being published that day to attendees, answer questions, and initiate discussions about how to elaborate on their reporting. Individuals and representatives of various organisations interested in the proposed topics usually take part. For example, Newstapa’s story on papers published by North Korean academics in bogus journals attracted participation from people in academia. They can sometimes become sources for stories or experts sharing knowledge. However, Jang said “it is not realistic to investigate and make editorial decisions together at this point” as they strive to preserve full editorial independence. While members can’t collaborate with staff or freelancers today, the value behind these in-person events is that it “is a special experience and [members] are more likely to feel invested with us and more loyal to us” said Jang. As such their emphasis is not on co-production but strengthening the bond between journalists and their supporters. As is normal for nonprofit structures, members of Southern California Public Radio don’t have voting rights and a board of directors reviews the business. Like supporters of most public radio stations, members cannot directly shape the governance or operational strategies of the organisation but have access to a range of benefits depending on how much they contribute. (Previous research shows most public radio stations only encourage financial giving and some very light volunteering.) Yet while member engagement doesn’t involve direct participation in the higher-tier of operational decision making, it does mean they can have some influence. 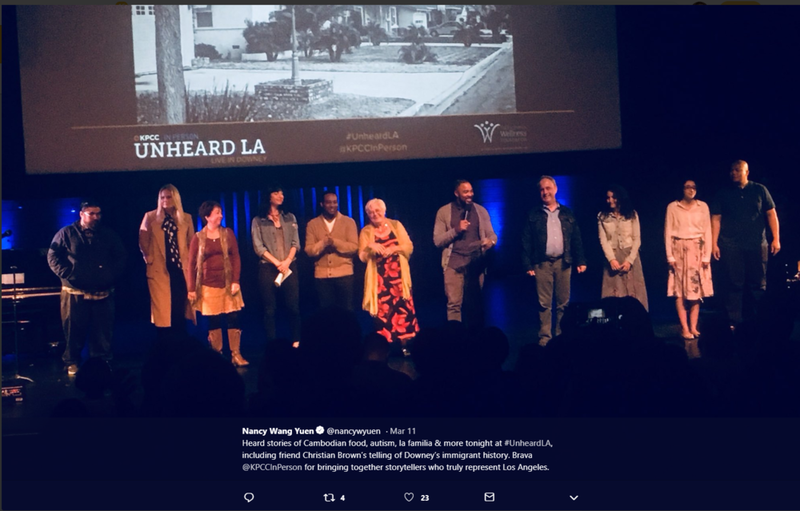 Unheard LA, their flagship project now in its second year, is a live event series that provides a platform for people from diverse communities to share stories based upon their individual experiences with audience members. This formula attracted a younger and more diverse audience than previous events. 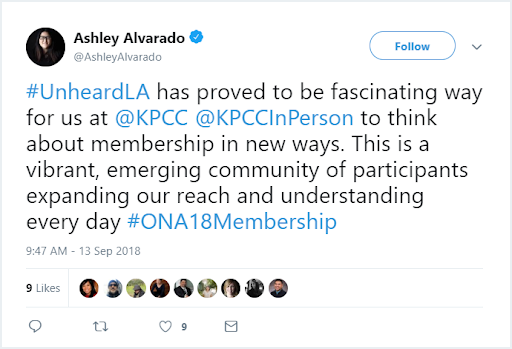 80% of Unheard LA’s audience had never attended another KPCC event. At KPCC, this doesn’t happen in a vacuum. The organisational set up is angled towards outreach and a chief content officer has “bought into engagement and audience first,” Ashley said. Unlike organisations which separate the responsibilities for engagement and membership or fundraising, KPCC aims to offer a palette of forums designed to foster participation. Several staff across the organisation are involved in developing engagement strategies and events, which “each have their own mission statement” said Ashley. While Unheard LA amplifies individual stories, gubernatorial town halls hold politicians to account, and their Community Open house is a chance to socialise with listeners and members alike. Swiss site Republik placed readers squarely “at the center” during its successful crowdfunding campaign in April 2017, raising CHF 3.5million from 13,845 members, or “publishers.” Publishers who pay an annual membership fee automatically become members of Project R - a non-profit co-operative with the aim of building sustainability for Swiss journalism, which owns 47.4% of Republik. This arrangement, in theory, gives them the opportunity to influence collaborative decision-making about the direction of the online magazine. 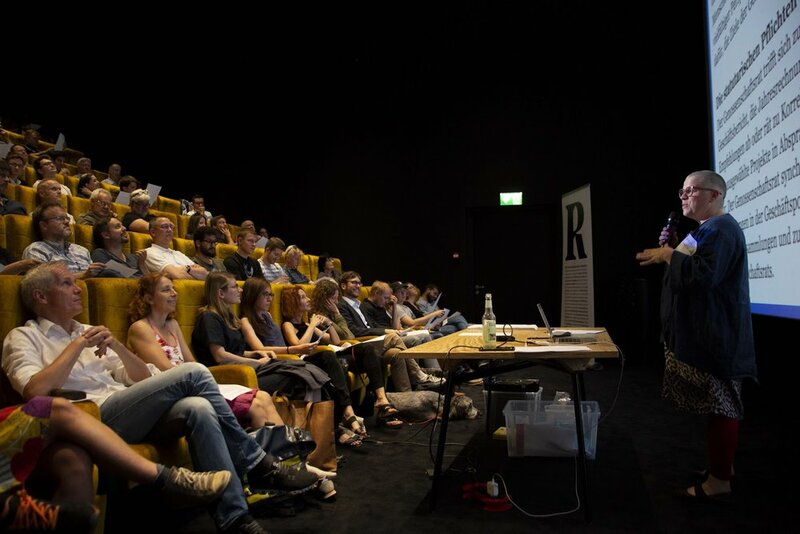 But while participatory engagement was baked into Republik’s founding philosophy and governance structure, site co-founder and head of community relations Richard Höchner admitted that their efforts in this space have been limited in a hectic first year. There has only been one instance of collaborative decision-making so far, when members voted to hire a new data journalist. But a serious step towards more participatory forums is forthcoming as Project R forms a member council of 30 publishers. The council will be “a mix of parliament, oversight, and control panel, think tank, debating club, and ideas development lab” and act as “the hinge between the Republik volunteers and the four-member board.” If the responsibilities listed there seem a little broad, that’s deliberate, Richard said. 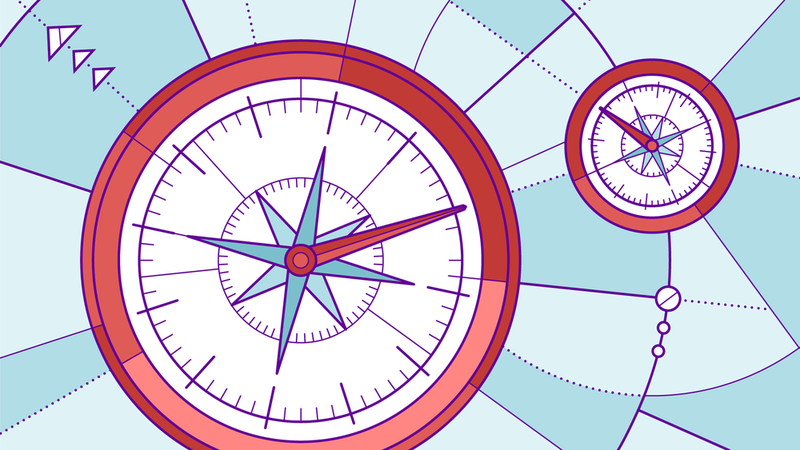 The new body’s first collaborative decision-making process will tackle exactly what kind of decisions it should be making. Put more simply: “The role of the council will be defined together with the council.” This type of self-determination around decision-making bodies was a recurring theme in our research. Republik has held a summer roadshow to find members for their cooperative council. In Zurich, more than 100 people attended. The last three years have represented a seismic transition for UK-based publication Positive News. Following the death of the publication’s founder in 2012, followed by its benefactor two years later, then-editor (now-publisher) Seán Dagan Wood was left searching for a new business model for the previously for-profit enterprise. In the end, he turned to an organisational structure which embodied the spirit of participatory engagement as a means of survival. In 2015, Seán and his staff launched a campaign called #OwnTheMedia - a community share offering that led to the publication becoming the world’s first global media co-operative financed through crowdfunding. 1,537 readers from 33 countries pledged a total of £263,422 (around $338,000) to become co-owners of Positive News, giving them the right to elect a board of directors (also made up of co-owners) who represent their interests and guard the values and purpose of the publication. Following an overhaul of the publication’s website and a relaunch of the previously free newspaper as a paid-for magazine, in 2016 Seán and his team started tentatively experimenting with the new forms of participatory engagement that their governance model mandated. The primary forum for this so far has been Positive News’ Annual Inspiration Meeting (AIM), the first of which was held last year. The new board of directors was announced here, based on votes cast ahead of the meeting, and attendees also took part in workshops on a range of business and editorial matters, from pitching ideas for stories to brainstorming marketing ideas and sharing feedback on the new magazine. There appeared to be a disconnect between co-owners, for whom Positive News is just one of many things in their lives, and staff, who are deep in Positive News’ dealings daily, which resulted in a struggle to make even events designed for deep engagement truly meaningful and useful. So for this year’s AIM, Seán said they will go back to looking at some fundamental building blocks, most importantly: what should Positive News’ membership scheme look like? This is where things get a little complicated: co-owners of Positive News are not automatically subscribers or members. 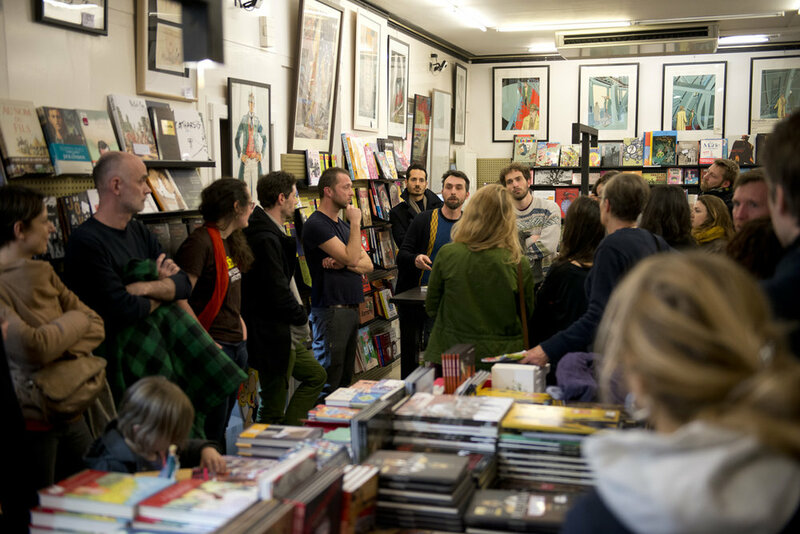 Subscribers to the print product (paying between £30 and £45 a year, depending on whether they are UK-based) might be co-owners, but only if they bought into the community share offering back in 2015. And Positive News is now experimenting with a third tier: supporters who, at the moment, can support Positive News’ journalism for £1 a month. Supporter benefits include priority invitation to Positive News events and exclusive emails. This type of “meta” collaborative decision-making around business matters is similar to what we saw at Republik: using participatory events to decide the very nature of participation. Organisations we spoke to regularly try to give their members agency over exactly what kind of role they do, or don’t, want to play in the organisation’s governance as newly developed membership models start to mature. In the UK, The Bristol Cable operates a governance structure with several distinct forums designed for consistent and meaningful member participation. As with KPCC, each requires the input of a varying number of staff and volunteers depending on its purpose. In May, for the third year in a row, the Bristol Cable’s annual general meeting attracted more than 100 people. (Disclosure: as former coordinator of the Cable, Alec co-organised 3 of these events.) AGMs can often harbour the dregs of legally required bureaucratic duties for cooperatives. Yet here, according to feedback from members it is “the most interactive, lively, and influential AGM in #Bristol” and even fun. Several coordinators facilitated and moved the AGM swiftly through engagement formulas designed for collaborative decision-making and co-production. Members received updates on organisational developments and finances with the opportunity to ask for clarifications. Group discussions and votes took place on issues such as the ethics of using Facebook, which objectives should money be prioritised for, and suggestions for editorial improvements. Isobel Tarr, a former membership engagement coordinator, said the AGM can be “most powerfully utilised for [decision making] … on issues that had been raised throughout the year,” whereas monthly members’ meetings serve better as a temperature check and as “an accountability forum that can lead to changes in the way we operate.” Through them the Bristol Cable can sustain ongoing consultations and co-production with members. On a journalistic front they are an opportunity for journalists to present and discuss their work, and seek the input of members in their research (another post explores public involvement in the production of journalism). The Cable has recently hired a community and events organiser who will add more capacity to its work in building “deeper and more meaningful relationships with people, both members and others,” said Adam Cantwell-Corn, operations and media coordinator. 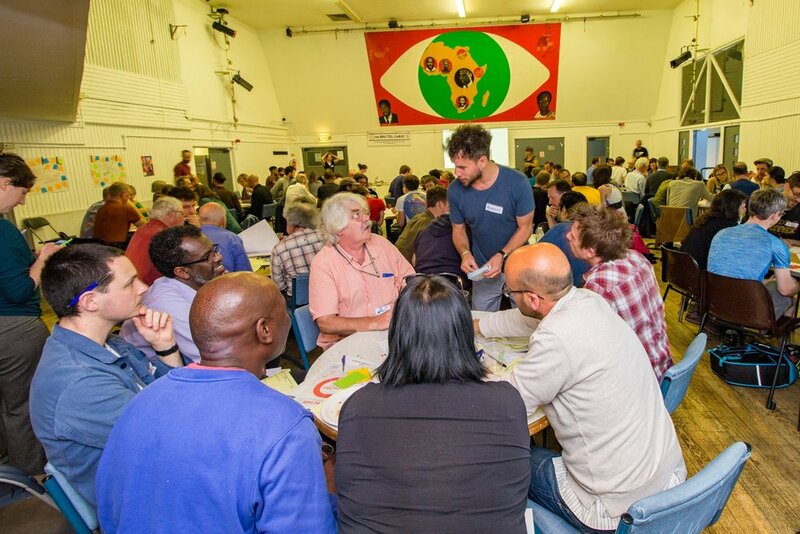 By coordinating with members and communities to co-host events in different parts of the city, they aim to increase the number and quality of forums for engagement, from democratic participation to high profile events. In 2015, days before Médor was set to release their first print edition centered around an investigation into a major pharmaceutical scam, a Belgian court sent them an injunction which effectively censored the piece. As a judge ordered the article to be published a few days later, the organisation founded by veteran journalists and graphic designers attracted a surge of public support. This new media cooperative seeking to do and fund journalism differently suddenly also became a flagbearer for press freedom. Several years later, Médor has internalised collaborative decision making and production between the teams working on the quarterly magazine, their core product. Yet despite functioning well as a worker cooperative, implementing wider participative governance for the cooperative members has been a struggle. Aside from participation during the AGM and the involvement of 3 members on the board of administration, several other initiatives have petered out. An example is the formation of a group of dedicated ambassadors, affectionately called “hamsters” (who would help make the organisation’s wheels spin…you get the idea). After a membership-wide consultation asking who would be prepared to volunteer to promote the work of Médor, twenty people (2% of the member base) came forward, which is close to the rate of engagement to be expected. Together with promoting content online, these members focused on organising informal gatherings in venues of their choice for mostly friends to come meet with a project co-founder. “Slowly the community was developed through personal interactions,” said Laurence Jenard, the operations manager, “which is also how the first subscriptions were picked up.” However, support for these volunteers, who were sometimes dispersed across the country, was limited due to lack of resources. Following poorly attended events the energy has dropped. As we’ve seen with other organisations that are strapped with few resources and small teams, this opens up questions regarding the involvement of members in shaping the future business plan. Today the rate of increase of subscribers and members of the cooperative’s member growth rate has plateaued. Though Médor currently has strong financial reserves thanks to its flying launch and generates a healthy 95% of its revenue from its readership, financial sustainability past three or four years is uncertain. Laurence said that the “pragmatic vision of facilitating a potential crowdfunding drive” leads Médor to consider the inherent value of involving members in refining future scenarios for long term sustainability. A democratically vetted business plan would have more traction with the public. However, it will be hard to secure this trust without building a more dedicated practice of engagement. Discussions around the constraints on engagement often center on resources, strategic priority, finding the right ask, or (less often) economic access. But there are places where the challenges are even more fundamental for organisations and their members. Southeast Asia-based New Naratif is primarily funded through private donations and grants, but its aim is to become self-sustaining through member support. Started in Singapore by historian and now managing director PJ Thum, New Naratif describes itself as a platform for journalism, art, research, and community with the aim of creating “space, understanding and skills for […] a more participatory Southeast Asia.” But New Naratif’s first year has been marked by controversy in Singapore (where its founders are based) - a country ranked 151st out of 180 on the 2018 World Press Freedom Index. In March, PJ and the site’s editor in chief Kirsten Han were called as individuals to testify before Singapore's Select Committee on Deliberate Online Falsehoods, convened to examine the issue of “fake news” in the country. Kirsten and PJ were both involved in lengthy and combative hearings, including discussion of a critical 2017 Human Rights Watch report on freedom of expression in Singapore and PJ’s research as a historian respectively. Then in April, an application to register a Singapore subsidiary of the UK company that owns New Naratif was rejected by Singapore’s Accounting and Corporate Regulatory Authority (ACRA), on grounds that the purposes of the proposed company were “clearly political in nature” and registration would be “contrary to Singapore’s national interests.” The result, according to Kirsten, is that New Naratif has no legal presence is Singapore and has had to suspend offline engagement - including monthly open meetings and democracy classrooms designed to foster discussion on social and political issues (you can read New Naratif’s response to ACRA’s decision here). How do you organise meaningful collaboration and co-production when your members are scattered across 20 countries and speak multiple languages? This is another challenge New Naratif faces. The site currently publishes primarily in English with some coverage in Bahasa Indonesia and Bahasa Malaysia (the official languages of Indonesia and Malaysia) but there are 13 official languages and hundreds of others spoken across Southeast Asia. (For a fascinating discussion of this challenge, as well as others New Naratif has faced in its first year, listen to this podcast they recorded with a live audience of members to mark their first anniversary). PJ Thum added that English is a “very elite language” in the region. Working primarily in this tongue therefore restricts the audience for your work not only linguistically but also economically, impacting New Naratif’s ultimate goal of imagining a more participatory Southeast Asia. PJ said the site has recently added consulting editors for North Sumatra and Jakarta and Papua to their staff, and run stories in Mandarin and Vietnamese with the help of volunteer translation from their members. They’re now planning their first piece of audience research, using online surveys and real-life interviews, conducted in English, to get a clearer idea of how their members currently use the site, what else they would like to get from membership, and how they would like to participate. First, an important clarification: an organisation’s position within this categorisation does not represent a fixed picture of all engagement activity at that particular organisation. A newsroom like Newstapa, which uses events to allow members to witness news production, may use feedback from these sessions to inform editorial decisions, and may also at some point in the future offer opportunities for members to directly influence them. What we hope this continuum does is highlight the range of ways news organisations can invite members into collaborative decision-making and co-production. It should also act as a reminder of the fact that to be able to do this kind of work, especially in the US and Europe, is a privilege not everyone is afforded. The common denominator between the seven organisations we spoke to is their commitment to be shaped by the input and respond to the feedback of members and the public - and there appears to be a correlation between investing in co-production and the positive feedback loop this creates for actual public participation. In addition, creating more participative and collaborative forums - whatever their format - is only one facet of an organisation’s activities that usually complements and enhances other ways of enhancing the value of what is already there. In other words, journalism and engagement have to work reciprocally to be mutually beneficial. The next question we should ask is: but to what end? Is engagement the silver bullet for sustainability? What is the value of the practices within these categories? We found that evaluating participatory engagement is often met with a growth focused metric mindset. But perhaps member-led and value-based organisations may want to ask more qualitative questions as they assess the benefits of collaborative decision-making and co-production: Did the event achieve its specific mission and contribute to the organisation’s wider strategy? Which activity and issue did people most engage with? What conversations came up? Who spoke up and who didn’t? What did people take away from the session? And what did the newsroom get smarter about? Emily Goligoski, David van Zeggeren, Jay Rosen, and Lukas Kouwets contributed to this post.